The Catholic Baptism ceremony for infants is the very picture of innocence and beauty. The Godparents of an adult or older child stand in witness to the Baptism and the adult candidate holds his or her head over the Baptismal font. The Baptism prayer is the same for infants, children, and adults. Baptism in emergency - Ordinary and conditional. Anyone can and should baptize, especially in an emergency. It is so important to do an emergency Baptism as quickly as possible if there is someone in danger of death; baby or adult, family or friend, stranger or acquaintance. All you need is natural water and one sentence. This means any water; but only water and as clean as you can get it. Water from the tap, a puddle, creek are fine as long as the water is as clean as possible. That's it! One line and you're done. Baptism is the first Catholic sacrament and the most necessary for gaining Heaven. 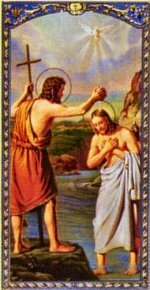 One must be baptized in order to receive the other sacraments which is why Baptism is first. If an infant is in danger of death, and a priest is not readily available, a lay-person can and should baptize. Parents may baptize, but if a doctor or nurse are available it is preferred that they perform the baptism. If possible find a sponsor to be a witness, even nurses and doctors on staff. Natural water suffices. Most hospitals have a glass of water nearby or a sink. The water must flow on the child's head if possible. Conditional Baptism is exactly the same as above with the intention or words to the effect that it is conditional, meaning in case the person is living and also not already baptized. If it is not certain that a person is alive or that life is present, Baptism is given conditionally using the intention or the words "If you are living I baptize thee, etc." Water is poured on the head in the same manner as usual or, if this is not possible, upon any recognizable human part. "If you are living I baptize thee..."
As for when life is present: As long as any part of the body is working whether by artificial means or by drugs, the soul is present. Long before the big day you will decide on your baptismal name or the name to give your child at baptism. TAN's old booklet Is It a Saint's Name, 1948 has a wonderful explanation of why to use the name of a saint for a new Catholic in Baptism. It also offers good guidance how to name a child based on the number of syllables in a name to match the last name. There are great guidelines for not giving a name that you might one day regret. 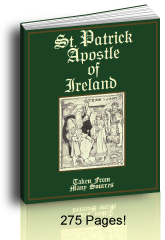 It has two lists of alphabetical names of saints divided into one list for girls names and one for boys names. Several variations of most of the names are given. It also gives a wonderful Catholic Baptism ceremony explanation and script. The words to the full Catholic Baptism ceremony is in the priest's prayer book, but it's nice to know ahead of time what to expect. There are extra prayers and Bible verses about Baptism that Father will read as you or baby "enters" the church. 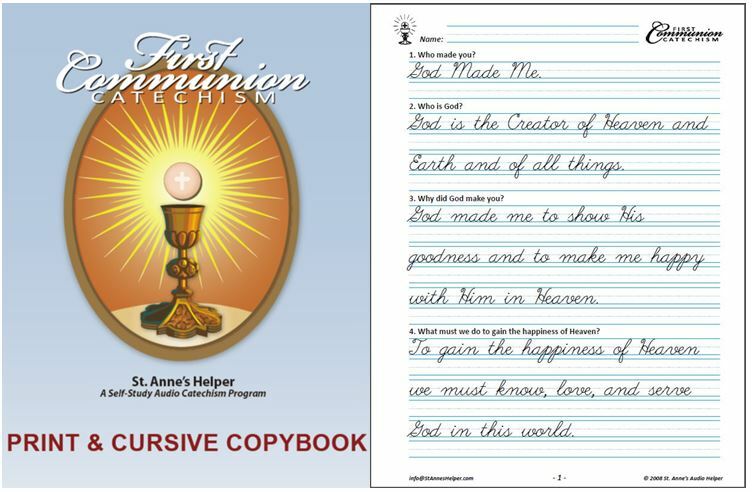 Sometimes Father will provide booklets for the Godparents and close family. Me? I'd ask to have or borrow this ahead of time if possible. An adult candidate for Baptism will know what to do from his preparation classes. The rest of us might not know what will happen, so just follow as Father directs. The Godparents are the ones who will have to do or say the baptismal responses. Father explains everything as he goes, he even says what the sponsors will say for them to repeat the same. Parents, Godparents, family and friends meet in the vestibule at church and the ceremony begins there since the first ceremony "brings the candidate into the church". At first, Father will write the information from the parents, sponsors, or candidate about the baptismal name on the temporary baptismal certificate. It will be used along with the date and place of birth, address, and parents' names and address on the official baptismal certificate. Usually the Godmother holds the baby through the Baptism ceremony while the Godfather stands next to her. Father recites the prayers for entering the Church and for exorcising the candidate. Father will prompt the sponsors for their answers, or sometime the parish will have a card or booklet that the sponsors can read. If the candidate is an adult, the Godparents stand next to him or her. During the ceremony Father will put a touch of salt on the baby's tongue and will anoint several places with the holy oilsl so it is important to be able to get the baptismal gown open at the back of the neck at one point. If the baby girl has a bonnet because of veiling in church or if it is winter and the boy has a hat or hood, this is a moment that can be tricky to manage. Hoods and blankets can be a handful. Simply ask for help if it is too much. Some churches can be super cold and newborn babies can be hard to keep warm. NB: I remember when one good priest made sure to caution the sponsors to say, "I do." not just "I will." as in some booklets. Then all present join to make a profession of faith in the Apostles' Creed and the Our Father. Then the sponsors answer for the candidate before the actual Baptism where Father will say the words and pour the water. "N., I baptize thee, in the name of the Father, and of the Son, and of the Holy Ghost." The priest anoints the child with Holy Chrism, as though sealing the baptism. He then places a white cloth, symbolic of the purity of life which should follow. "N., go in peace, and the Lord be with you. Amen." It is so beautiful when the priest takes the parents and baby to Our Lady's altar and has them offer their child to Our Lady. Be sure to request it of Father before the ceremony so he can have the prayers ready. After this it is customary to give Father an offering, or a stipend. The amount is determined by diocesan statute or local custom. Be generous when you can. 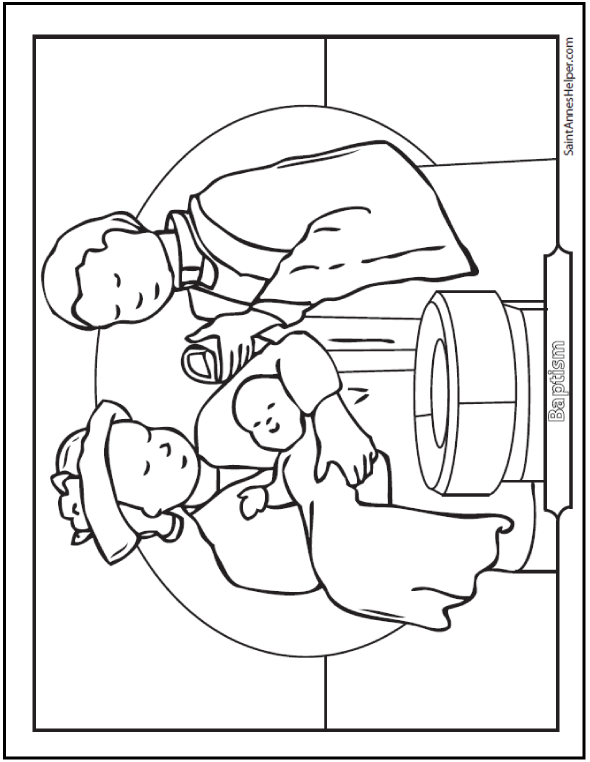 Teaching children about Baptism can be easy and sweet with our free printable coloring pages. Use them as greetings or presents from your little ones, too. Pray that nothing happens before baby is Baptized at church. Let your pastor know when baby is nearly due and be sure to call him promptly once baby is born. See the emergency Baptism directions above if there is any danger that baby is seriously ill or otherwise in danger of death. It is super easy to memorize the words, especially if you already know how to make the sign of the cross. Choose good Catholic Godparents. Ask them to pray for you or your child. First in order of time, and while you are expecting baby's arrival, is to choose good Catholics to be your child's Godparents. If you die, they will be the ones who have the responsibility to help raise your children as faithful Catholics. Grandparents and other relatives are usually wonderful Godparents as are close friends who are living the Catholic Faith. They often have the time and the means to pray and help raise the child. Mom and Dad should ask the Godparents early enough so that they know the due date and can make the normal arrangements to be at your parish. If they live a great distance, they will need to be able to plan their travels or you will need another couple to proxy for them. If you are the one being asked to be a Godparent, be sure that you're prepared for the responsibility that might fall on your shoulders. 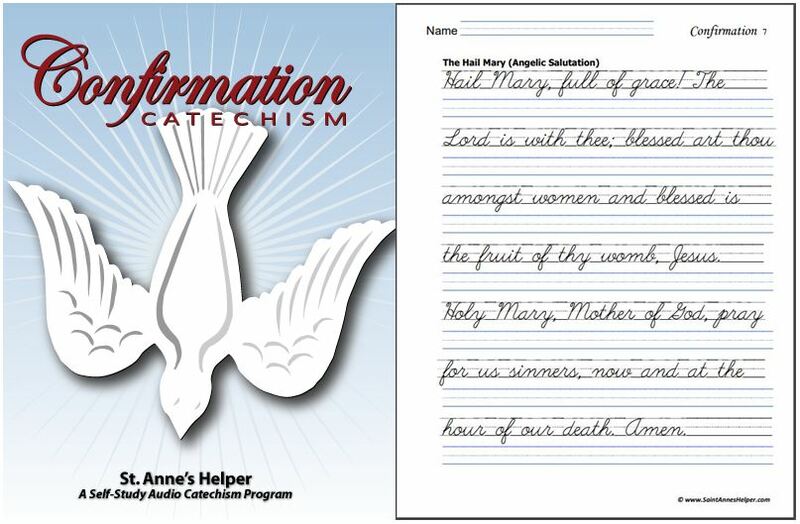 Are you prepared to provide this child's Catholic education? Ask your pastor what the obligations are. Once baby is born, call the priest so as to arrange for the Baptism. Try to have the Baptism as soon as possible, one to fourteen days if Father can make the arrangements. Many saints were baptized on the same day as their birth. Old books are prudent in advising not to wait longer than a week or a month. Baptism parties? Keep them simple, especially when there's a newborn involved. Mom may be worn out and tired and Baby doesn't last long with all the extra attention outside the ceremony. The important thing is to have the child baptized as soon as possible and to allow the mother rest. Mother does not need to be present at the baptism, and the family can have the party later. Depending on the time of day, if the Grandparents or Godparents can arrange to have snacks or a cake ready and waiting after the baptism, it is a huge help to the family. If it is before lunch or dinner, arrange to have a full meal ready. This is a huge act of charity because going out to eat can be its own burden. It just depends on the situation. If the mother is not feeling well, the father, family, and friends can step in with these chores. When Baby is nearly due, brothers and sisters love to learn about the upcoming Baptism. If you have other children, they want to be ready for the event, too. Older children have learned much about the Catholic sacraments when they study about the sacraments in their catechism or religion class, yet when "their" baby is getting baptized the sacraments come alive! They own the joy themselves. The time to prepare is before Baby's due date. Have Sunday clothes ready so Dad and Grandparents can find them. Remember to gather shoes and socks. Every week keep the children's Sunday clothes handy for the trip to church, just like you keep their day clothes ready for the possibility that they will have to go to Grandma's or a friend's house for the birth. The children might be able to leave from there for the Baptism. The first few days around a birth are so busy and you want to have the Baptism as soon yet as no-fuss as possible. 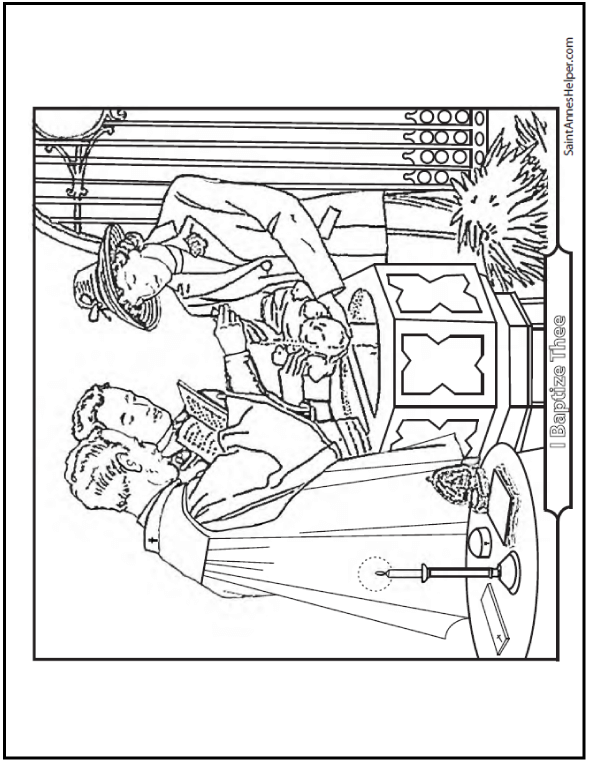 It's fun to help your children make little gifts or color coloring pages for baby. Print what you want your children to use ahead of time and keep it in a good place (like Mom's dresser) for the Baptismal day. Build the joy ahead of this blessed event. I'm sure there are things I am forgetting to mention. Everyone's situation is different, so try to pre-think what might be handy to do ahead of time. With adults the "preparation" is one of education and prayer. 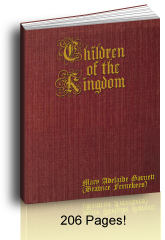 Read here to prepare older children or an adult seeking baptism. After helping you prepare for the sacrament, meaning catechism and classes, Father will explain what the Baptism ceremony will be like. The parish and priest usually handle most of the Baptism ceremony, so there's little for you to do on that day. Your sponsor can tell you what he or she knows, too. The ceremony is usually the same as for infants, yet your sponsors do not carry you. At an adult Baptism the candidate simply leans over the Baptismal font, where as an infant is held over the font. Be sure to let your friends and family know when the date will be so that they have time to arrange to attend the ceremony. Having family at your baptism is a real joy. If they are interested in your faith, who knows? They, too, might convert. For example, I have a friend who had been worried about telling her parents that she was considering the Catholic faith. She was really worried about how to let them know. Wonder of wonders they, too, had made the same decision. So did several of her adult children! It's such a neat story. With an adult there's more time and inclination to host a reception or Baptism party after the ceremony; so this is a consideration, too. It is very nice to be able to welcome the new Catholic and to congratulate him or her.